Burritos aren't just something you have at a Mexican restaurant that instantly gives you food coma. They're super easy to create at home. This recipe is for burritos without rice and beans. 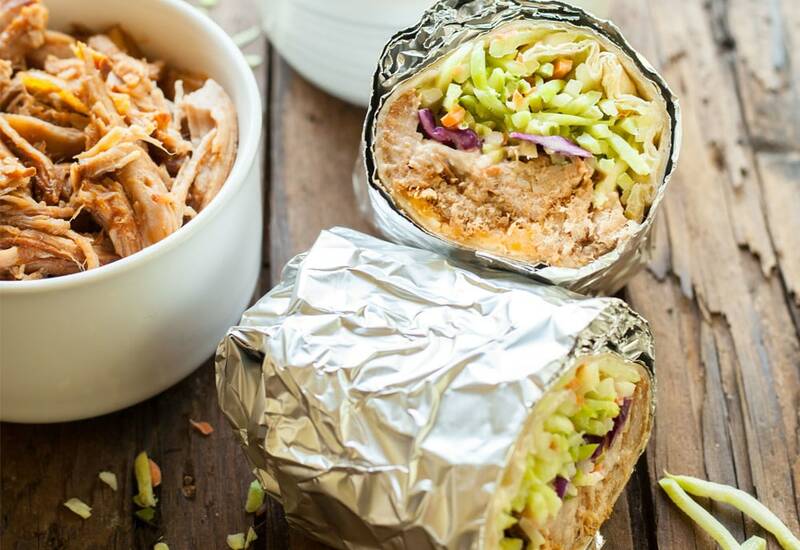 The star ingredient is pork made in a slow cooker, which is then wrapped in a tortilla with some crunchy veggie slaw. While the pork is simmering in a tangy barbeque sauce, you can go off and do all those things you said you were too busy to do. When you come back, assemble the broccoli slaw, heat up the tortillas, and you're ready to rock and roll. If the pork seems a little dry when shredding, mix in some of the delicious liquid in the slow cooker. If you have any pork leftover, pile it into sandwiches with coleslaw. Or you could layer them on tortillas with cheese in a skillet to make quesadillas. You can also freeze the pork. Put it in a resealable bag and lay flat in the freezer or put in a freezer-safe container. Per Serving: 334 calories; 15g fat; 40.2g carbohydrates; 11g protein; 29mg cholesterol; 816mg sodium. Pulled pork is the perfect burrito filling, and I am very pleased with how this turned out. The one part of the recipe that was tricky was figuring out that the broccoli slaw actually meant just the undressed shredded broccoli. I was a little confused as to why I'd dress something twice. Once I got past that I totally figured it out and it turned out great! Nothing but good things to say about this hearty pork burrito. The only thing I would probably do differently would be to smother it in a sauce. Exceptional, delicious, and easy to make in the slow cooker.